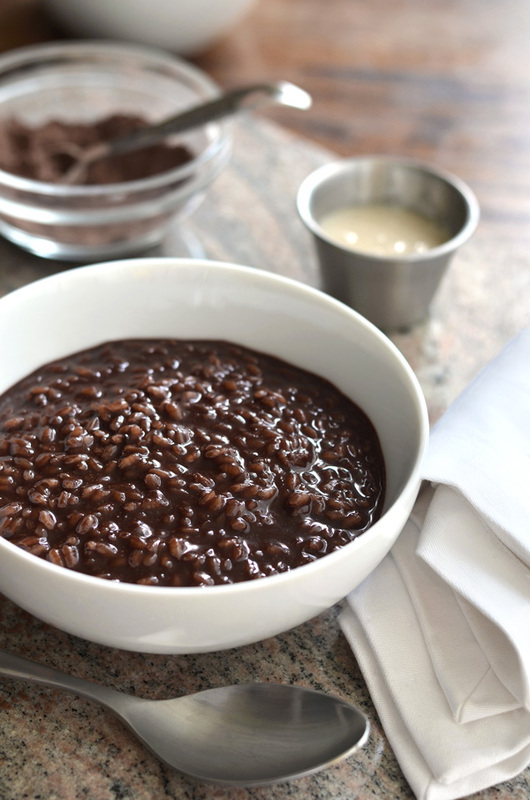 Champorado is a kind of chocolate rice pudding eaten in the Philippines. 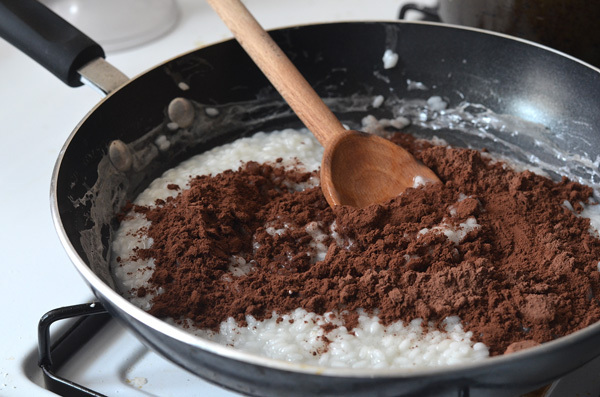 This is not to be confused with the Mexican champurrado, which is more of a hot chocolate drink. I had a roommate a while back that was freaking out with excitement when she discovered a pot of this was cooking up in the kitchen. It’s a rare treat around here, I guess! 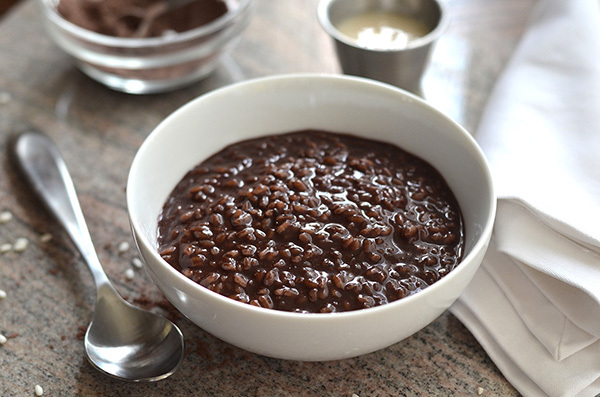 Champorado is normally eaten for breakfast or just as a snack. 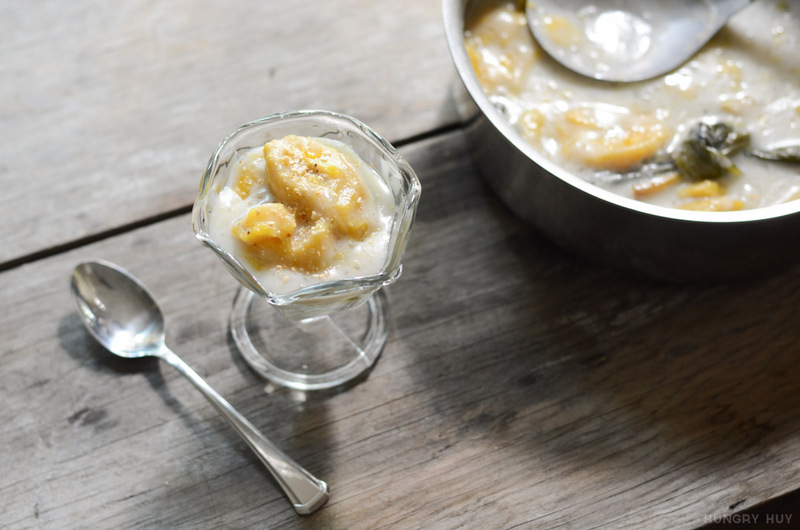 Sometimes milk is added, and sometimes it’s topped with condensed milk too. However for this recipe, there’s no milk, and it’s sweetened with sugar. 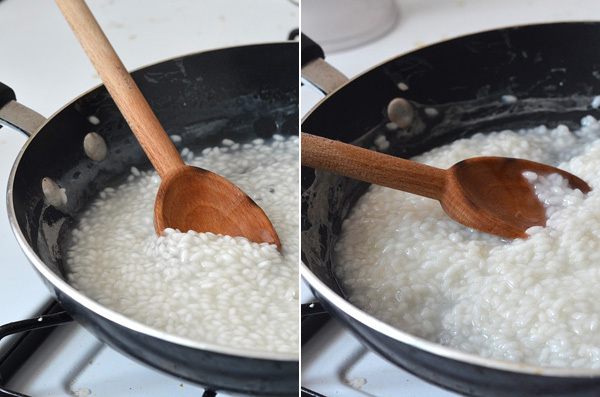 Add rice and water to the pan on medium to medium-high heat and stir until it starts to expand and absorb water. Test the rice by eating a grain every 2 minutes or so after it looks kind of soft. 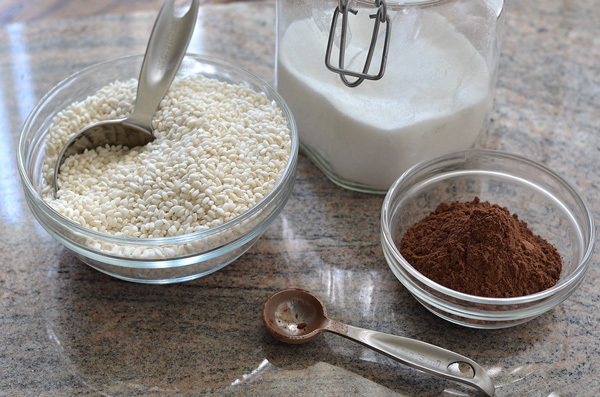 Only when it’s fully cooked to your liking, add the cocoa powder and mix thoroughly. After the sugar is fully mixed in, serve. Brings back memories from my childhood -thanks! Kinda cool that food does that to us hm? Thanks for stoppin by! 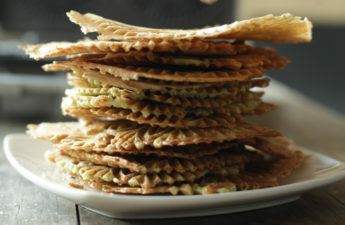 how do you feel about adding vanilla extract or other extracts to it? It’s simple enough to take a few additions without blowing up. But I like mine plain. I have seen the photo from other site but no recipe and today the Vietnamese cooking has it, thank you. I had eaten this porridge like goodies when I was a child. This is an ultimate comfort for us Filipinos especially many of us who live overseas. This taste great with added coconut milk. Try topping this generously with evaporated milk, or powdered skim milk or powdered coffee creamer. Soooooo good! Interesting, never really used those as toppings but it sounds good 🙂 Thanks for the tip Rose! 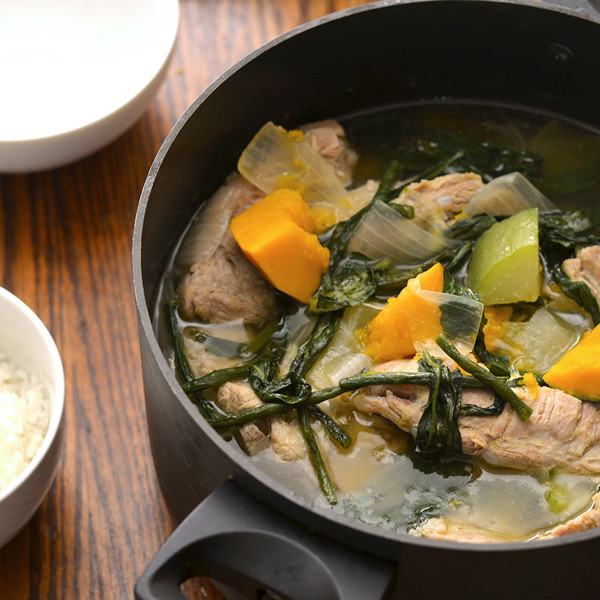 I’m new to your site and I am surprised to see not just Vietnamese dishes but Filipino as well. I’m Filipino-Australian married to a Vietnamese-Australian. 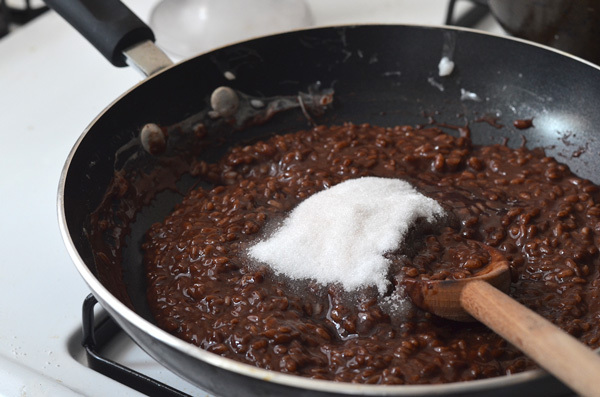 Anyway, Champorado is normally eaten with “tuyo” (dried fish). Your photos look amazing! On a different note, I shall try your Ban Xeo this week. my MIL’s recipe has a sprinkle of beer in it. She says it helps to make it crispy if you can’t sit your batter long enough. Thanks for all the resources you’re sharing here. Hey Mish–Filipino cuisine is great, you’re lucky to have an ‘in’ into sharing both Viet and Filipino cuisine too :). Noted on the tuyo, I had no idea! Interesting tip on the beer for banh xeo batter, I haven’t tried that myself. 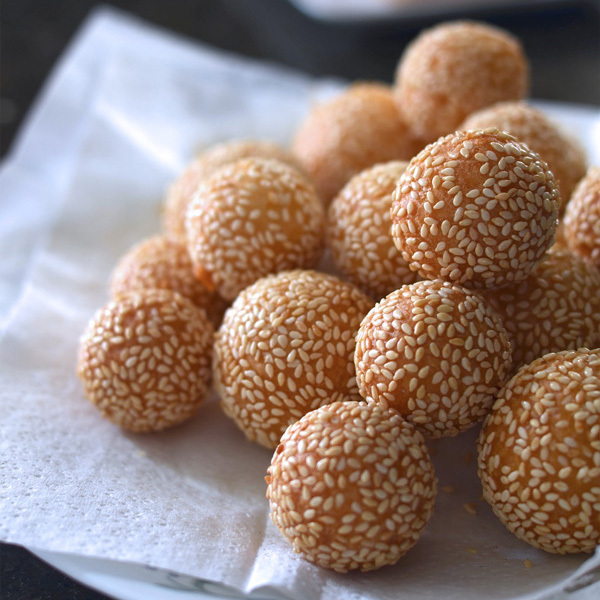 If there’s little drop in quality, it could be worth it for banh xeo emergencies. I’ll have to try this out, but would love to hear your results if you do it first. 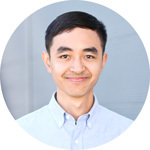 Perhaps drop a comment on the banh xeo post? Thanks for sharing! In Hawai’i, Filipino Chocolate Pudding, was usually the pig blood dish they have lol. Just wanted to share. But this dessert looks really good!